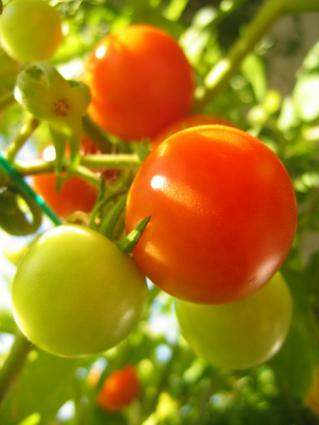 Tomatoes are a rich source of folate. The connection between folic acid and colon cancer is confusing. Current research is mixed regarding whether this nutrient prevents or actually encourages certain forms of cancer. The disparity between these two findings couldn't be wider, and the jury is still out as to which research is the most accurate. Although subtle supplementation with folic acid may be a healthy effort towards disease prevention, consumers will want to think twice about mega-dosing on this vitamin. It is for this last reason that folic acid is so common in commercial foods. Folic acid has been shown to lower the chances of neural tube defects in the fetus during gestation. Conditions such as spinal bifida may be preventable by folic acid supplementation throughout the early stages of pregnancy. Hence, many foods have been fortified with folate in an effort to decrease the chances of a deficiency in pregnancy women. However, are such high doses necessarily safe or recommended in all areas of disease prevention? Research becomes tricky where establishing a firm link between folic acid and colon cancer is concerned. In 2010, MSNBC reported upon recent studies that seem to imply that high doses of folic acid can actually cause colon cancer and other forms of cancer. Apparently, Chilean officials released findings showing a connection between increased cases of colon cancer in hospitals since folate fortified foods were introduced in the country. Another study in Norway found that cases of cancer increased by 21 percent when patients underwent supplementation with 800 milligrams of folic acid. However, these latest Norwegian findings dealt with lung cancer, not colon. In contrast, the American Journal of Clinical Nutrician shares a study that shows folic acid may be an important nutrient in general cancer prevention. Studies prior to 1994 seemed to indicate that folate actually lowers a female's chance of colon cancer. A later and even larger-scale study supported these findings, showing that individuals who consumed at least two alcoholic beverages a day were significantly less likely to develop colon cancer if they supplemented their diet with folic acid. A 2010 study, however, concluded that the vitamin had no significant effect on cancer, the likelihood of stroke, or heart attacks. The American Cancer Society does gloss over some pointed scientific views that attempt to link folate supplementation with a possible increase in cancer, but no firm link has been established. Until current research can issue a firm statement concerning the role of folic acid when it comes to colon cancer, the most solid conclusion readers can arrive at is in regards to the amount and means of folic acid acquisition. The American Cancer Society wraps up its manifesto on folate with the idea that it is safer to obtain this nutrient from whole foods such as fresh produce rather than fortified cereals and orange juice. It is difficult to overdose on folic acid by such means, as the vitamins in whole foods are found complete with the cofactors and enzymes necessary for their assimilation. Moreover, this could reduce one's overall intake of processed foods which have been noted to increase one's chances of colon cancer anyway. Considering that raw fresh produce is absolutely packed with antioxidants and phytochemicals which the American Cancer Center believe may actually fight and prevent colon cancer, this approach offers a win/win solution for concerned individuals. Whatever approach you decide to take, however, it is important to talk with your healthcare provider before adding folic acid to your health regiment.